i could hear the saxophonist on the corner out the window; it’s not uncommon in nyc. at yamaha artist services to record the two solo piano hymn albums, i was caught up in the christmas carol he was playing, only a little concerned that it would bleed onto the recording. the amazing “it’s fine!” ken can handle anything. my task was to get onto tape (so to speak) the material for both of the hymn albums: ALWAYS WITH US Volume 1 and ALWAYS WITH US Volume 2. it was easy for me to compile a list of the hymns to play; so many years of church music gives me an advantage that way. but on every album, even if it is music i haven’t written but am giving my own voice to (like the hymn albums or christmas albums or lullaby album) i always include one or two pieces that i have composed – a signature of sorts. for always with us volume one it was the title track. ALWAYS WITH US is a statement of my belief that we are never alone, we are always surrounded by infinite grace and love – God is always with us. like all the tracks on the hymn albums, this piece is solo piano. part of that time in the city, i also recorded the album AS IT IS. i had a list of titles and in-between recording hymns, i would take out the list and simply play the word. but i’ve talked about that before. this album was a personal creative challenge and took on a life of its own. back in chicago, in post-production work, ken wrote orchestration arrangements (he is brilliant) and brought in musicians to record on tracks for the AS IT IS album, starting with the solo piano recordings. these new tracks went beyond the solo piano versions – in texture, in diversity, ultimately, in emotion. yesterday i wrote about process in david’s painting. the same -yet different- process exists in recording music. the coming-together of layers, with what is in a layer below sometimes hidden, a breath you can’t hear, but can feel. i am awed by what the whole becomes from the whole. always with us exists in two forms. both are relevant to the album they are within. both speak a language. but both tell the same story – for those who listen – that we are never alone. God – or whatever you call this presence- is always with us. and if you listen, maybe with your mind’s eye, you might even hear the strains of a saxophonist on the corner in the city at night. Categories: kerri sherwood, ks friday, recording artist, Uncategorized, yamaha | Tags: always with us products, always with us volume 1, always with us volume 2, as it is, breath, cdbaby: kerri sherwood, composer, composing, creativity, faith, God, hymn albums, hymn cds, itunes: kerri sherwood, ken abeling, kerri sherwood, kerrianddavid.com, kerrianddavid.com/the-melange, kerrisherwood.com, leggings, lincoln music productions, lincoln music publications, music, new york city, nyc, orchestration, personal challenge, process, record, record an album, recording artist, recording process, recording tracks, solo piano, solo piano hymns, yamaha, yamaha artist services, yamaha recording artist | Permalink. trust. practice. faith. repeat. not necessarily in that order. through the ages, a common challenge – faith without seeing. ‘we’ are no different now than ‘they’ were ‘back then.’ faith. it’s ambiguous. it’s funny. you might think that the most faith-reinforcing moments come during a service and this true for some. as a minister of music for three decades, i have always sought to create those moments for others…when all things come together: music, lyrics, emotion to amplify the words (and the word) spoken in the service and resonate within someone’s heart and reinforce their feelings of faith. it is a job i take seriously; sometimes you only have one chance to help connect a service with a person’s heart, one chance to reassure, one chance to raise awareness, one chance to have them ask questions within their faith, to challenge their assumptions for and otherwise. as a minister of music, i have heard a lot of sermons and been at an un-countable number of services. think about it. (and this is not counting all the years not spent in this position, nor does it count all the extra services at certain times of the year…you’re thinking, “ok, ok, ohmygosh, we get it!” ) so thirty years multiplied by 52 weeks multiplied by at least two services a sunday (sometimes three, but we will round it to two, as you roll your eyes.) that equals 3,120 services and sermons. and let me just mention, some have been…ummm…way better than others. so you would likely deduce that i would know all the stories of the old and new testaments pretty well by now. well, i beg to differ with you. for me, those stories are peripheral. what really counts for me is the stuff you can’t see with your eyes, the things you can only experience: love, kindness, peace, generosity… simplicities. complexities. these are the foundations of my faith. faith in goodness. faith in being held. faith in grace. choosing actions that are life-giving. knowing that if i fail today, i can try again tomorrow. walking the broken road, faithfully believing that there is a higher power that i can’t see but i can experience. one that surrounds me in my joy and in my pain. ptom, in his lenten sermon the other evening, said, “God is for you.” it takes a little (read: a lot of) practice; it’s a new day every new day. but i believe. Categories: chicken marsala monday, kerri sherwood, life, Uncategorized | Tags: ambiguity, belief, believe, blind faith, chicken marsala, chicken marsala monday, church, church service, easter, elca hymnal, faith, faith cards, faith designs, faith leggings, faith mugs, faith products, faith takes practice, faith-reinforcing moments, generosity, God, grace, itunes: kerri sherwood, jeremy camp, kerri sherwood, kerrianddavid.com, kerrianddavid.com/the-melange, kerrisherwood.com, kindness, lent, life-giving, love, marty haugen, minister of music, moments, peace, practice, practice faith, presence, proof, sermons, society6.com/chickenmarsala, society6.com/kerrisherwood, the melange, trust, truth, universe, unseeing, walk by faith, we walk by faith and not by sight | Permalink. we have a frog! this sweet green quiet sitting-on-one-of-the-small-boulders-on-the-edge-of-the-pond little creature makes us so happy. i was summoned from the backyard, “k.dot, quick! hurry!” i ran outside to stand at the edge of the little pond. “we have a frog!” he said. i looked down and this beautiful creature was sunning himself on a rock. 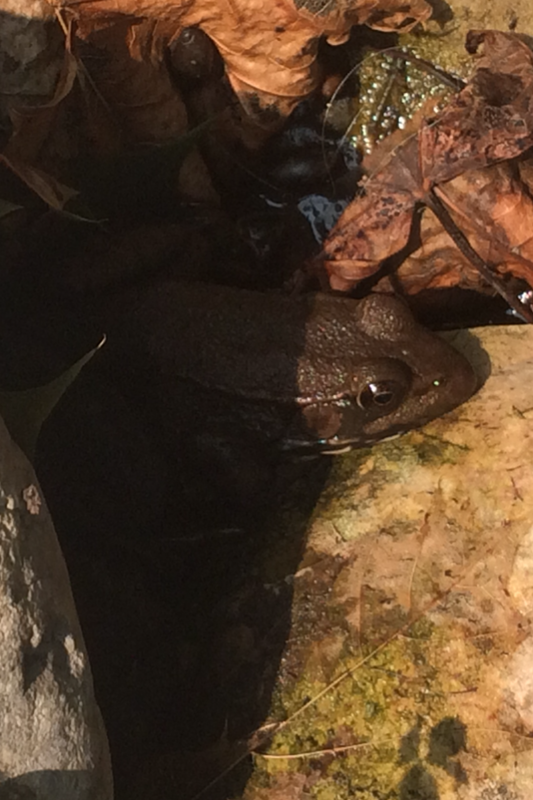 now, having a frog in our pond is no small feat. although lake michigan is a block away, there aren’t frogs running amuck in the yards close by. two years ago one other frog visited here. but this frog, well, it couldn’t be better timed. helen, who is infinitely wise, told us over hot coffee and soup one cold day last year that having a frog show up in your life is even more meaningful. “it’s not just a frog”, she told us. “it’s a reminder.” a reminder of what, we asked? “frog is a reminder to ‘fully rely on God’,” she explained. thank you, little frog, for the reminder. you are so welcome here. Categories: kerrisherwood, life, momma, story | Tags: change, faith, frog, God, kerrisherwood, life, metamorphosis, momma, pond, rebirth, story, transformation, transience, transition | Permalink.